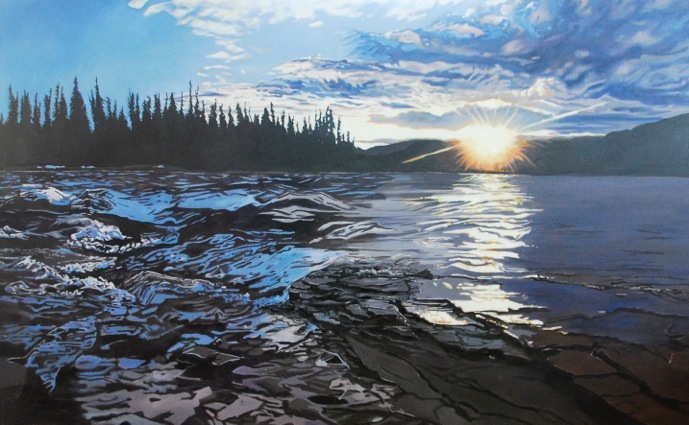 Renowned local artist, Cindy Vincent of Fort St. John painted the large, 4’x6′ ‘Peace River’ and is generously donating all proceeds from the sale of giclee canvas prints and cards of the original painting to the Peace Valley Environment Association. My love of nature has led me to a life long pursuit in oil painting with the hopes of capturing a little of the beauty I see around me. Cards with the print on them can be purchased for $3.50 each or 5 for $15 or 10 for $25. The original 4’x6′ print is presently on display at Peace Gallery North in the North Peace Cultural Centre in Fort St. John, BC and is available to be purchased for $13,500.00. Note: above prices include tax. *Giclee prints are extremely high quality prints created from multiple scanned images of the original painting. The prints are done on mounted canvas. Cindy touches up the giclees slightly, at not extra charge, so that each one is unique. Donations to help support our campaign to Protect the Peace are gratefully received. Details on how to make a donation can be found near the bottom of the page here.